The Study Tour Grant (STG) program, which is supported by the JSCE International Scientific Exchange Fund has invited to Japan outstanding civil engineering students and young engineers who are recommended by the Agreement of Cooperation (AOC) sosieties every year since 1992. This year, seven students and engineers from Myanmar, Vietnam, Mongolia, Turkey, the Philippines, Thailand, and Bangladesh participated in the this program. 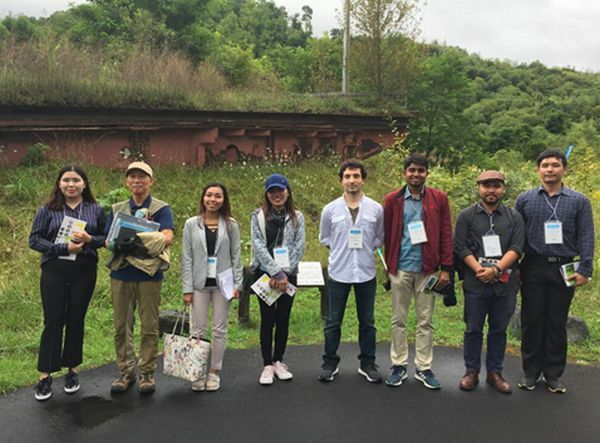 Following the program planned by the International Scientific Exchange Fund Committee, STG participants spent one week from August 26th to September 1st to learn about the civil engineering technology of Japan and to make a technical exchange with Japanese civil engineers and researchers. The program is consisted of three activities: visits visiting to technical research facilities, observing the construction sites, and giving presentations at the International Summer Symposium (International Program) held at the 2017 JSCE Annual Meeting. On August 27th, they visited the Kajima Technical Research Institute Nishichofu Complex in Chofu, Tokyo and the improvement project on the Tokyo Outer Ring Road, the Central Junction North-Side Ramp (joint venture with Obayashi Corporation). On the following day, they visited the Railway Technical Research Institute and the Shimizu Institute of Technology, then flew to Sapporo. On the morning of August 29th, the first day of the JSCE Annual Meeting, they participated in the 20th International Summer Symposium (International Program) at Hokkaido University. Together with international students studying in Japan, the STG participants presented their papers using PowerPoint. After the symposium they had lunch at the school cafeteria, and in the afternoon, they visited civil engineering facilities related to Ishikari River flood control, such as the Sousei Bridge and Kawano Hakubutsukan (river museum). In the evening, they went back to Hokkaido University to attend a networking reception hosted by the International Activities Center (IAC). They formed closer relationships with IAC officials and students from other countries who had also participated in the Symposium. On August 30th, their last day in Hokkaido, the STG participants together with Yuka Ito of the Young Civil Engineers Power Up Sub-Committee (JR East) and Tadatoshi Nakayama (NIPPON KOEI CO., LTD.) went by chartered bus to see the construction site of Hokkaido Electric Power’s Ishikari Bay New Port Power Station and the Toyako Visitor Center, Volcano Science Museum. At the Ishikari Bay New Port Power Station, they visited the facilities in the power station and the construction site of the LNG terminal tank after receiving an outline explanation of the construction plan. They were particularly interested in the mechanism of thermal power generation and asked many questions. At the Toyako Visitor Center, Volcano Science Museum, Meister Shinji Goto explained in English the history of Mt. Usu, the mechanism of volcanos, and the damage situation, and then introduced the Experience Area. Thanks to his explanation, the STG participants were able to feel the overwhelming power of nature and the spirit of the Earth. 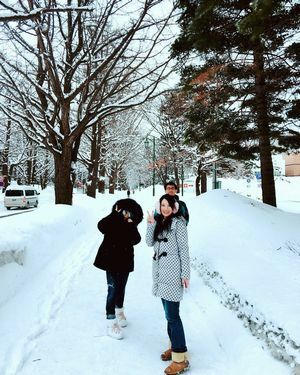 They enjoyed their visit to Hokkaido even though they had to race through their two-day trip, and flew back to Tokyo in the evening. On the 31st, the day before their departure, they had some free time in the morning, and in the afternoon, all the STG participants enjoyed visiting Asakusa, Tokyo Skytree and other tourist sites in Tokyo. In the evening, they attended a dinner party with the International Scientific Exchange Fund Committee. The participants talked about their impression of the Symposium in which they had given their presentations, the sites they visited, and their future aspirations and career options. The peaceful atmosphere was conducive to friendly conversation and strengthening of relationships with the committee members. Finally, thanks to the cooperative efforts of everyone involved, particularly those of the Hokkaido Regional Development Bureau, Ministry of Land, Infrastructure, Transport and Tourism, and Hokkaido Electric Power, the program concluded successfully and without incident. We express our gratitude and hope to receive your ongoing cooperation and support. Under the slogan “Becoming a university that supports world-class advanced research,” which is led by President Seiichi Matsuo, Nagoya University promotes education for internationalization on a university-wide basis. In addition to participating in the Ministry of Education, Culture, Sports, Science and Technology (MEXT) Top Global University Project, we have also established satellite campuses in many countries in Asia, and there are a variety of ongoing international programs at the university. The Civil and Environmental Engineering Program has focused on international education since its establishment. In particular, since we started officially receiving international students under the MEXT International Special Graduate Programs that commenced in 1987, the Civil and Environmental Engineering Program has continued to expand its education for internationalization. 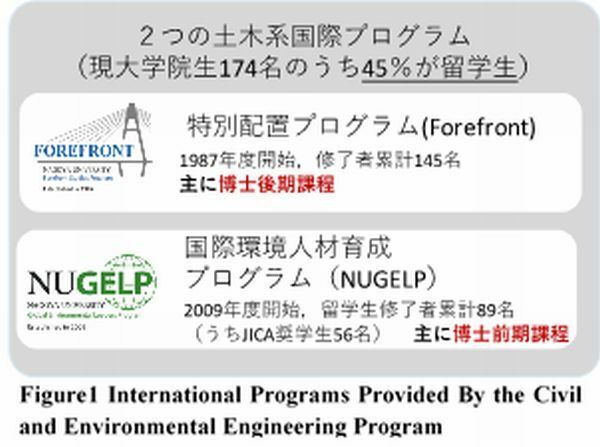 The international program provided by the Civil and Environmental Engineering Program is one of the oldest international educational programs at Nagoya University (Figure1). Since 1987, we have accepted excellent international students, most of whom are in doctoral courses, with the Forefront Program that was adopted as one of the MEXT International Special Graduate Programs. As a result, many world-class human resources have been produced. 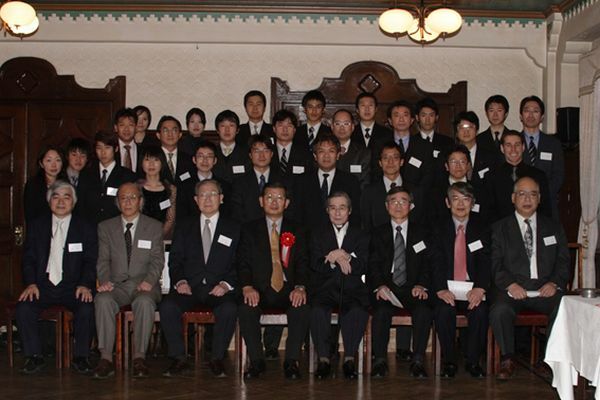 In 2008, Nagoya University established a program to develop international human resources specializing in the environment field, that is, the Nagoya University Global Environmental Leaders Program (NUGELP) supported by MEXT Strategic Funds for the Promotion of Science and Technology, Strategic Program for Fostering Environmental Leaders. Mainly targeting students in master’s courses, NUGELP forms a mixed community of Japanese and international students, and provides educational programs only in English. NUGELP collaborates with JICA human resource development projects in receiving outstanding young high-level government officials from the Philippines, Vietnam, Myanmar, Cambodia, Mongolia, and countries in Africa as master’s students. Those students are in line for forging the future of the government of their home country after completion of their master’s course. The international program has received 365 students as of 2017 through those programs. The development of civil engineers with an international background who will become the bridges between developing countries and Japan is imperative if we want to realize sustainable development together with developing countries. 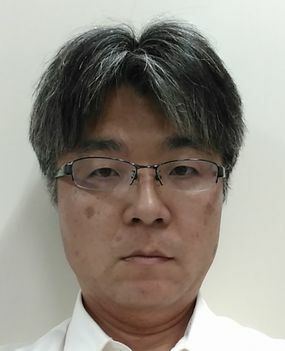 The Nagoya University Civil and Environmental Engineering Program has appointed an associate professor in charge of internationalization in the faculty since 2017. 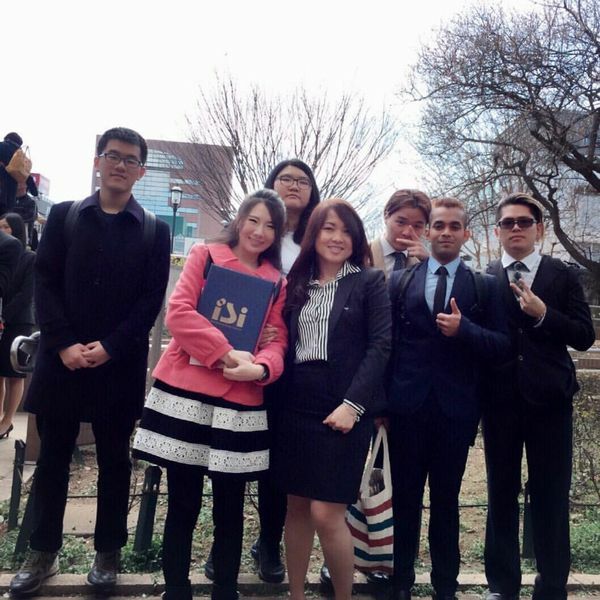 With a clerical assistant in charge of international students, a clerical assistant in charge of JICA projects and the Civil Engineering International Committee(15 from each department), we conduct education for internationalization in the Civil and Environmental Engineering Program. With the aim of developing civil engineers who not only speak fluent English but also have advanced communication skills, we try to establish a system in which international exchange of students is expanded in the international programs, and thus continue its support. The improved design of social infrastructure will create the framework of society after another one to two hundred years. We continue to focus on internationalization so that civil engineers graduating from Japanese universities can contribute to global sustainable development. Three years ago, when most of my friends were busy with getting married and having a baby, I made a decision that I would go to Japan to start my new life. In the eyes of my parents, their daughter did something that totally was not agreeable to her age of 28 years old, it should be the age of finding a boyfriend or getting married just like her friends did; however, their daughter decided to go abroad, leaving home. As a girl who grew up under the attentive care of her parents, I was so eager to go outside to see a fantastic world. We have only one life, don’t we? I just don’t want to spend my life in an ordinary way but go on my own way. So despite of my parents’ objection, I chose a different way from others did. Now I’m studying at Saitama University for my second master’s degree. When I look back upon the past three years, I never thought I would be able to learn much from Japan and realized that what a wise decision I made three years ago. The first one and a half years in Japan, it might be the most relaxing time in my life. Lectures were given only half day in Japanese, and as an excessive a transition period of adjusting to a new environment, I tried to slow down my pace of daily life as much as possible. Comparing to the busy life of office workers, I got much time to study a new language and enjoy spending time by myself and with my new friends. Also, I visited Hokkaido, Okinawa, Lake Kawaguchi, Mount Fuji, Karuizawa, and some other famous tourist spots around the country with my friends and had many unfrogettable memories. ・Sorry (Sumi Masen/Gomen nasai)- My new life in Japan started from the Japanese language school. “Sumi Masen” is the first Japanese word that I learned, and it has been the most frequently used word in my daily life. In China when we get help from others we only say “Thank you” to express our gratitude, whereas in Japan, I always heard that Japanese say “Sumi Masen” before saying “Thank you”. Japanese consider what other people think, thus they use “Sumi masen” or “Gomen nasai” to express their apologies for disturbing others. ・Thank you (Arigatou)- In Japan, everybody says “Arigatou” for even minor matters. No matter who they are, co-workers, friends or even family members, they never stint in saying “thank you”. Every time I go out with my Japanese friend, she always says “O san, thank you for going out with me today”. Sometimes we take for granted that we don’t need to say “thank you” since we are close friends or family. The longer I stay Japan, the more I come to realize that I seldom say “thank you” to my family and friends back home. ・In China- The traffic lights are always ignored by pedestrians, and they see the traffic lights are placed just for cars and buses. Cyclists may cross your way no matter traffic lights are on or off. The way of crossing roads in China is that you NEVER cross road alone, or even in pairs, but Wait a small group and cross the roads together. Take a position in the middle of the group and then walk along with them. Crossing roads in China always makes me nervous. ・In Japan- I never worry about that I must try my best to play the real-life game “Pedestrian vs. Cyclists” when I cross road in Japan. Everybody follows traffic rules and cars always give the priority to pedestrians. One day I happened to see that a car stopped to let some pupils cross a crosswalk. I know that is common in Japan! However, after crossing the road, those pupils did something I never expected: they turned around and bowed to express their thanks to the driver! I was impressed by them. That you would never see such that scene in China. The driver and pupils taught me the importance of having mutual respect; at the same time, I realized that the kindness, love and respect were in the Japanese culture. ・Mutual concession creates the “an empty seat in train”: In a train packed with passengers, there is often an empty seat in which no one dares to sit. ・When I was writing this essay, I suddenly come to realize that I have never heard a single horn blowing in these three years. As I sit down to write this reflection of my time studying in Japan and the opportunities that have followed, it is announced that the death toll from flooding and landslides in western Japan has exceeded 200 and is expected to rise further. Add to this the millions of citizens ordered to evacuate their homes, and it would be fair to call this Japan’s worst flooding disaster since the Nagasaki floods in 1982. This news sits heavy with me, having spent six years contributing to flood forecasting research at Kyoto University’s Disaster Prevention Research Institute. Living now in South Australia, the driest state in the driest inhabited continent on earth, I have long ago shifted my specialty from flood forecasting to optimization of water infrastructure, and more recently an even greater departure to focus on establishing a business in the field of manufacturing management. As a young man, Japan and the Japanese language fascinated me, initially due to the uniqueness and alien nature of the culture and language, but increasingly due to the opportunity associated with technical and commercial relations between my home country and Japan, which for Australia had been our most important trading partner for 35 years. This, together with a desire to move outside of my comfort zone, inspired me to spend a year in a high school in Hakodate, Hokkaido, and later apply to undertake masters and PhD studies as a student of Kyoto University’s Graduate School of Engineering as a recipient of a Monbukagakusho Scholarship. Japanese universities, each with their own personality and expertise, have a lot to offer the foreign student. In the case of Kyoto University and my very supportive, open-minded and wise Professor Toshiharu Kojiri, the opportunity offered me was that of an environment to explore and grow. First and foremost, the focus during these years was academic studies which I found fascinating, but in addition to this time was available for developing linguistic, social and creative skills that continue to serve me well today in my more entrepreneurial adventures. Now in my 40’s, I am into my sixth year of running a consulting and training company, Shinka Management, which I founded together with a like-minded friend back in 2012, with the mission of supporting global industry in learning and adopting Japanese manufacturing management practices. This field, called Lean Manufacturing in the west, has a history of several decades and continues to grow in popularity. Increasingly, companies around the world are looking to learn about lean manufacturing practices and culture; especially kaizen and the Toyota Production System; to help improve safety, quality and productivity within their companies. Our team is uniquely placed to provide foreign companies with access some of the best lean manufacturing know-how that exists in Japan. In addition to consulting and training services provided globally, our team runs regular week-long study missions to Japan under the title Lean Japan Tour, a program we run at least ten times a year that provides corporate leaders with an opportunity to learn and experience lean manufacturing directly in Japan. In addition to the classroom seminars focused on the Toyota Production System and hands-on training experienced during the tour program, our clients over the years have been fortunate to visit factories belonging to around forty different Japanese companies and organisations, including automotive, food and beverage, transport and government related organisations. The week of learning activities is complemented by cultural activities unique to Japan. Our clients return to their home countries, not only enlightened about Japanese operations management practices, but also touched by the generosity and warm hospitality of the Japanese people. Having myself benefited deeply from my relationship with Japan, it is always a great pleasure to introduce others to this very special country. Having started as a two-man operation serving limited clients in Australia, we’ve had the great fortune of growing Shinka Management into a team now comprising engineers, bilingual management consultants, interpreters and former factory managers from Toyota Motor Corporation, and are proud to support clients from over 50 countries. 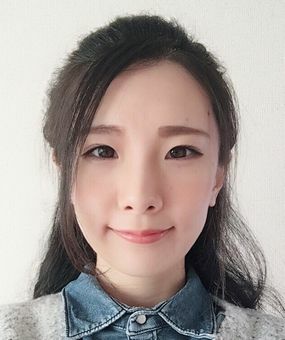 We have a lot to learn as our team continues to grow our business going forward, but for myself I have no doubt that my journey to date would not have been possible without the time made available during my studies in Japan to explore a mix of academia, engineering and entrepreneurial interests. It is this time which gave me the confidence and skills to undertake this exciting and rewarding phase in my life. 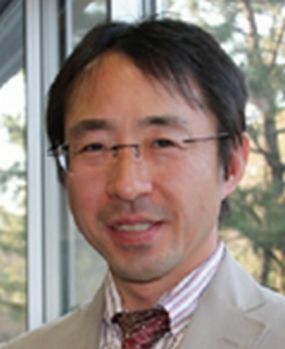 Professor Kojiri sadly passed away shortly after the completion of my studies in Kyoto, but I will forever be thankful to him and the other academic staff at the Disaster Prevention Research Institute, for the patience and generous support provided to myself and the other foreign students based at the institute. I hope to continue to utilise the skills developed during my time in Japan to connect foreign companies with Japanese industry through our work at Shinka Management. Profile: Born in Australia in 1977, Paul studied Japanese language in high school prior to spending a year in Hokkaido as a Rotary Exchange Student. 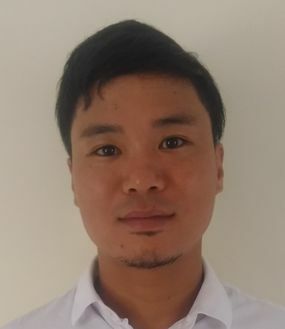 Paul completed his bachelor studies in Civil and Environmental Engineering at the University of Adelaide, and his masters and PhD in Civil Engineering Systems at Kyoto University as a Monbukagakusho Scholarship recipient. 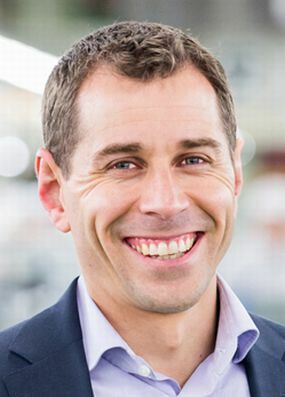 Paul runs a management consulting firm headquartered in Australia (http://shinkamanagement.com/) supporting global industry with lean manufacturing consulting, training and Japan industry study tours. Mr. Paul was a model for other students. In addition to be excellent in academics, he brought vibrancy to the laboratory with a Brazilian student named Paul. Holding high interests in Japanese culture, he certainly had noticed the uniqueness of the Japanese culture. “Why Japanese pray to both the temples and the shrines?” there was once he asked me a question like this. When there were insufficient personnel to conduct irrigation facility planning survey in the danger zone of Afghanistan, he volunteered to do it. With the spirit of adventure and challenge, the versatile Paul will expand his activities to achieve bigger success without doubt. 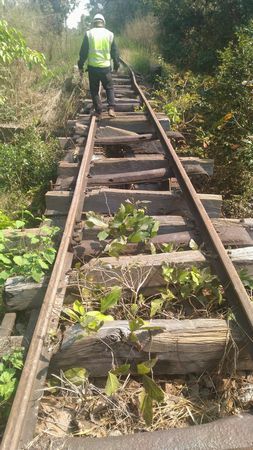 There are two railway lines in Cambodia. One is northern line (385 km) and the other one is southern line (264 km). Both lines were seriously damaged and destroyed during 1970’s civil war (Photo 1). Especially, some sections in the northern line was stopped its operation for about 45 years after the civil war. 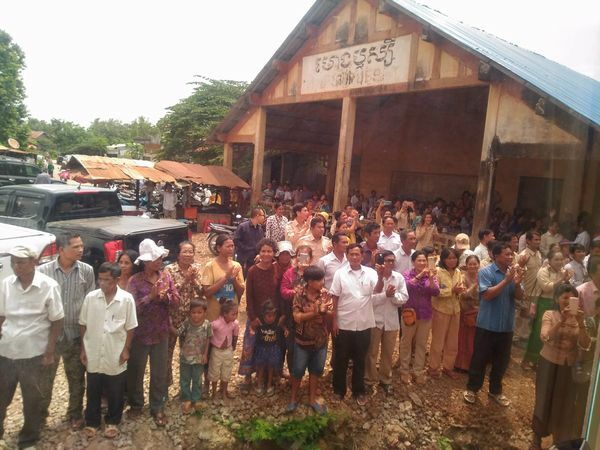 Therefore, it is one of the dreams for Cambodia to re-construct the railway lines and start the train operation same as before. 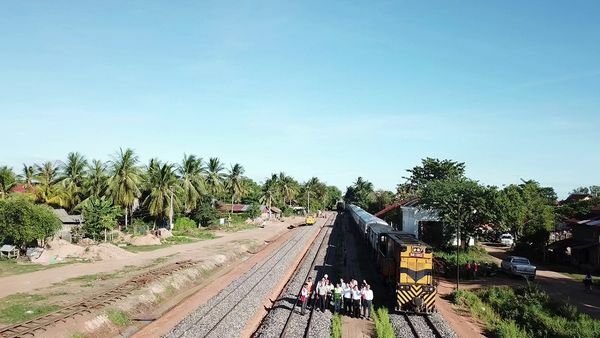 The northern line starts from Phnom Penh, the capital city of Cambodia and extend 385km toward the north up to Poipet, a city at the border of Cambodia and Thailand. The Scope of rehabilitation works of northern line covered to 1) re-construct the embankment, 2) repair the track, 3) repair the bridges, 4) install side ditches, etc. The Project is divided into 19 package consisted of many Contractors from China, Thailand, and Cambodia. We, NIPPON KOEI CO., LTD. worked as the consultant to supervise above all packages. The first package started the construction from January 2016. The train operation for entire northern line started from July 2018, taking almost 2.5 years from the start of the project. Although many problems happened during the construction, the most impressive memory that I have is the day of the train-operation opening ceremony, which was carried out on 4th April 2018. After the speech by the Minister of Public Works and Transport, the first train with many passengers on board started slowly from the station blowing the whistle, getting huge cheers from the local people, breaking the 45-year-suspneded operation.